We’re here to keep you cool, 24/7. Our Tech Support team is standing by to ensure your Pro Chiller is operating at the perfect temperature, no matter the weather. We have a dedicated team of technicians on staff to answer your questions and provide support. We even have a technician on call seven days a week for emergency after-hours support. Get real-time updates on your order. 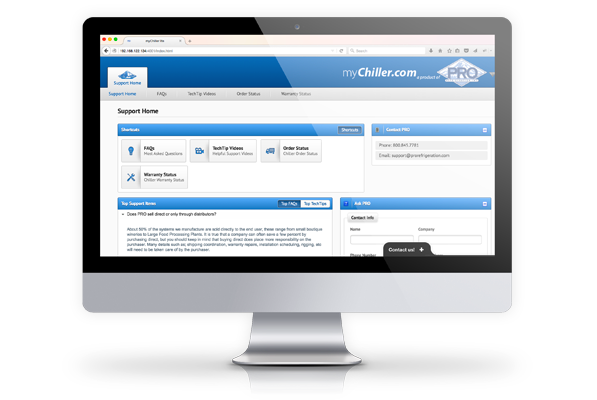 Once you’ve become a Pro Chilled customer, MyChiller.com is the place for you. We’ve put together a series of helpful how-to videos and answered our customers’ most frequently asked questions. Plus, you can track the status of your order and see information about your warranty. Become a pro with Pro. Take an upcoming class at our HQ in Auburn, WA. Pro invested heavily on our state of the art Training and Tech Center. The goal was to simply provide the best training program in the industry with a balance of hands-on training backed up by important classroom lectures and presentations developed specifically on our products. Operational Chiller System for functionality, service, and maintenance training. Operational bulk tank cooling center complete with CIP wash system. Operational Direct Expansion Evaporator and Glycol Heat Exchanger stations. Three high voltage electrical control panel simulator stations covering the entire Pro Chiller Series. Brazing and Soldering station with pressure/burst testing capability. We understand the commitment of both time and money to attend our training programs, we take this seriously with a commitment to assuring it is a worthy investment. In addition to offering training to our customers and service partners, Pro is committed to also utilizing these facilities for continuous training of the Pro Team.